If the app goldrush has taught us anything, it’s that any dummy can come up with a pitch for an on-demand service. And while most of them are totally unnecessary (nobody asked for your “Uber but on skateboards” idea, sorry), every so often somebody comes up with something simple-yet-brilliant, and legitimately helpful. The most popular on-demand services are moving away from the one-size-fits-all approach and taking on personalized tasks that were once supplied by a local professional. 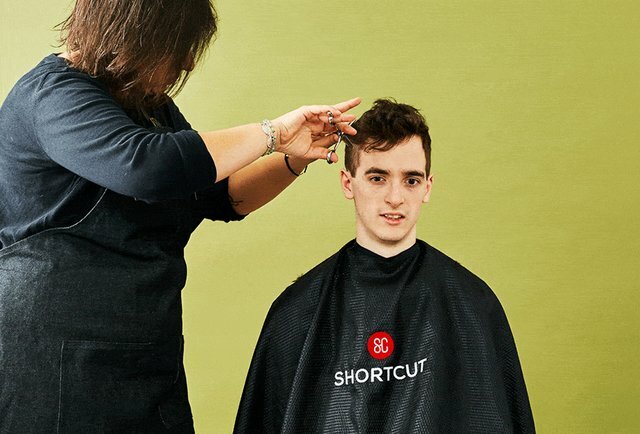 Enter Shortcut, a promising new app that will send a barber to your home or office at the push of a button. The goal is to provide custom styling and haircuts, without any mess, anywhere you need one. People are understandably skeptical about the goal of disrupting one of the oldest professions in the world, but co-founder and CEO of Shortcut, Irvin Slobodskaya, doesn’t see it that way. In the classic app-genesis story, Slobodskaya and co-founder Will Newton came up with the idea for Shortcut after frustration with traditional barber shops. “When you’re working in a corporate environment and working 9 to 8, you don’t have time to leave and get a haircut,” says Slobodskaya. According to Slobodskaya, most barber shops don’t offer online booking platforms, and the ones that do still force you to come to them -- so tech 1.0. Being curious (and long overdue for a cut), I had to try Shortcut out for myself. I was able to schedule a cut in advance with Alex Kantor, a barber and writer whose work can be seen on her Instagram hurbyher. 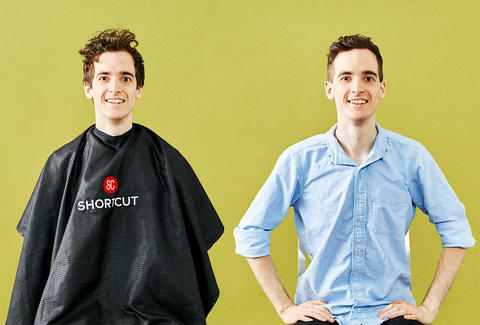 Conveniently, Shortcut allows you to contact your barber in advance, just in case you need to ask if they’re OK with being part of a photo shoot for an article about their job. Or you could find out if they’re allergic to cats, send them a door code, or request they wear a funny hat (probably don’t do this). I met with Alex outside Thrillist’s offices and brought her up to the photo studio where she would cut my hair. After laying down a dropcloth to catch all my hair (they’re sticklers about cleanup -- one motto is “no hair left behind”) we got to talking about what style I wanted and how I usually got my hair cut. The consultation was surprisingly extensive for an on-demand service, and Alex mentioned she usually spends an hour on her first appointments, since she likes to get to know clients and how they style their hair. The whole experience feels very luxe, even though haircuts only go for $50, which is pretty reasonable for New York. (Slobodskaya mentioned that future versions of the app will allow barbers to set their own costs, so they can cover a range of price points.) While I spent the whole time getting my haircut making silly faces at our cameras, I can see how you could use that time to, say, make important business decisions or tweet about foreign policy. 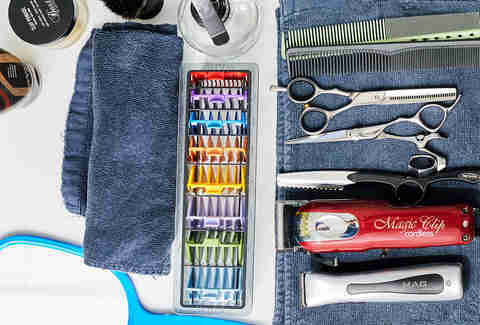 Being able to get the cut at any time is also helpful -- Alex mentioned that she’d given plenty of haircuts to guys who needed something last-minute, and Irv said they’d even heard of a barber cutting a best man’s hair right before the wedding. Who knows -- maybe in the future we’ll all be getting our hair cut at 4AM. 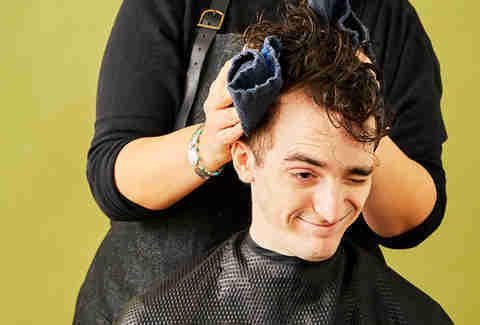 Getting customers used to in-house haircuts might take time, but the changes could be dramatic. Cutting barbershops out of the equation reduces waiting time and removes real estate costs. Whether Shortcut will disrupt the one of the world’s oldest jobs remains to be seen, but the potential is there.